John Blyberg started this meme with his MacBook in a Maytag shot. When Pollyalida responded, it made me realize that I had a laptop, an iPod, and a cell phone that needed a little rinse, too. The camera? Oh yeah. 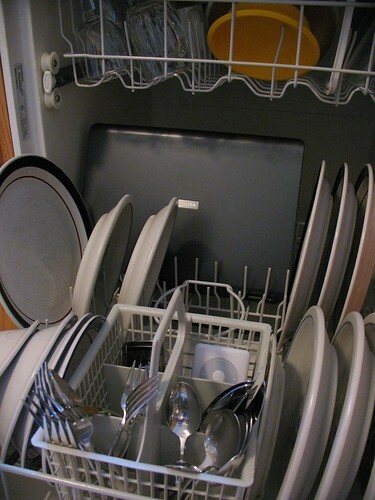 Let me toss that in now before the detergent cycle starts up. Pierce County Library has had a vibrant StaffWeb for nine years and it has become integral in system communications and information. But nine years of patching and upgrading took a toll. The website and its software platform started showing its age. Last year we were moving full steam ahead in our Social Web Literacy classes when we finally got the permission and budget for a complete overhaul. Talk about great timing! We couldn’t pass up the opportunity to build web 2.0 tools into the new intranet. Our project committee discussed how social networking tools could enhance efficiency and communication. Staff would also get daily practice using these tools in the course of their work. It was a win-win. One of the first things you see on the new home page is a tag cloud. Every page of the StaffWeb can be tagged by staff using their own words. They can then follow up on their tags, use tags from the aggregated tag clouds, or run a tag search. Success story: We have a travel expense reimbursement claim form that, despite past efforts, people have at least a dozen different names for. Now everyone can call it what they will and still find it. The tag cloud sits on a tab, but it’s only one of six customizable tabs waiting to be put to use. 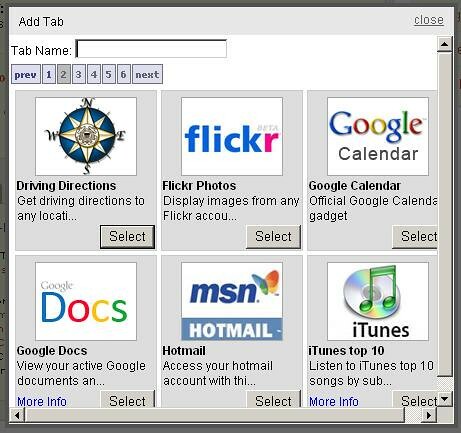 Staff can add widgets to the tabs on their home page. We currently have 32 widgets to choose from, including feeds from Flickr, iTunes, and email. If staff need a quick connection to the bookmarks they’ve stashed in their del.icio.us account, they can reach them using a widget on their home page. Common work tools like Google documents and Remember the Milk, and feeds from blog, weather, and traffic websites make this a well-rounded collection. We may add to the 32 flavors of widgets as everyone begins to use them and seek out more. Then there are the blogs. 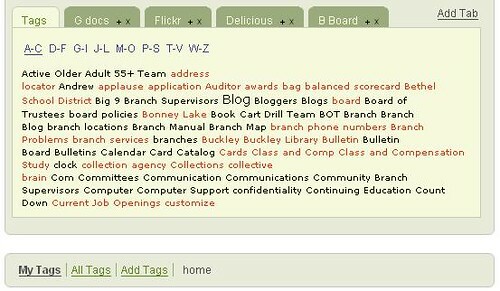 Each department and branch can have their own blog now. A few have already started. We envisioned the blogs as a “here’s the latest news” clipboard for people who work in those locations, but it might morph. Supervisors can add quick notes and routine updates for regular staff. Substitutes can tap in and read them from other work sites … or home. 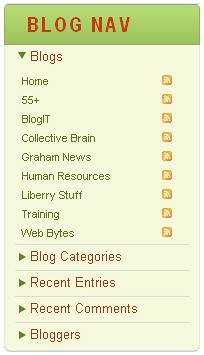 Every blog has an RSS feed so a “need-to-know” staff member can subscribe to whichever he/she chooses. Dozens of staff are already adding content to the regular StaffWeb pages, but the system collaboration will increase yet again once we unveil a staff wiki later this month. We honestly don’t know where the wiki will lead us (that’s a wiki’s nature! ), but we suspect reference staff will share tricks at pulling gems out of the catalog, circulation staff will elaborate on workflow practices, and IT will tell us how best to unjam the printers. But don’t count on it to be that well-defined! Who is to say that reference people can’t enlighten us on printer jams or circ staff don’t know the best way to limit action DVD searches by language? We’ll see how it works out. It could be messy, but worthwhile. Since many of the tools are customizable, we’ve created a personal log in. Once signed into the StaffWeb from work or home, staff can see their tags and widgets, comment on the blogs, and (when a new payroll installation is complete) call up their own HR information. We’re just settling into this vast playground of web 2.0 tools. Once staff become old pros at their use, they’ll have no problem relating to patrons navigating the same tools on the social web. We already have public blogs and a wiki, but don’t you think we’ll want to move more of these cool tools over to the public side, too?